These game-changing party tips will let you focus on what's really important — THE GAME. 1. Cook a bunch of hot dogs at once in a crock pot. You don't even have to add water! Just make sure you give yourself enough time — it could take 2–4 hours. Directions here. 2. Use a salad spinner to evenly coat your wings. Just throw in the wings and the wing sauce and give it a spin. Directions and recipe here. 3. A wine glass in a bowl makes a great chips 'n' dip set. 4. Unload your beer cans like a BOSS. Don't miss a single moment of the game with this chore of a task. 5. A DIY nacho bar is not only a super fun idea, but it requires less prep. Perfect if you have a small kitchen and don't feel much like cooking. 6. Run out of ice? Freeze individual water bottles and use them as ice packs in your cooler. This way, when they melt, people have water to drink, which is important for a long day of heavy drinking. 7. Enjoy your chips without dumping them into a bowl. 8. Mix beer with Sprite to make beer punch. You get to decide whether this is totally festive or utterly blasphemous. Get the recipe here. 9. The kids can join in on the fun with these custom Super Bowl bingo cards. Print the cards out yourself here. Or make your own. Or turn it into a drinking game for the adults. Salami, cheese, and olives. That's it. 11. Keep things moving with a chalkboard menu. "YAY SPORTS!" My sentiments exactly. 12. Eye black stickers are the fastest way to get your game face on. 13. Teach your guests the RIGHT way to eat a chicken wing. Then pull out the big bone. 14. Set up your own beer tasting. Chalk on black kraft paper makes an adorable table cover. 15. Tie a bottle opener to the drink tub or cooler. 16. If you don't want people leaving their half-drunk drinks around, these cups are an easy way to help your guests keep track. No pen needed! Order them here. 17. 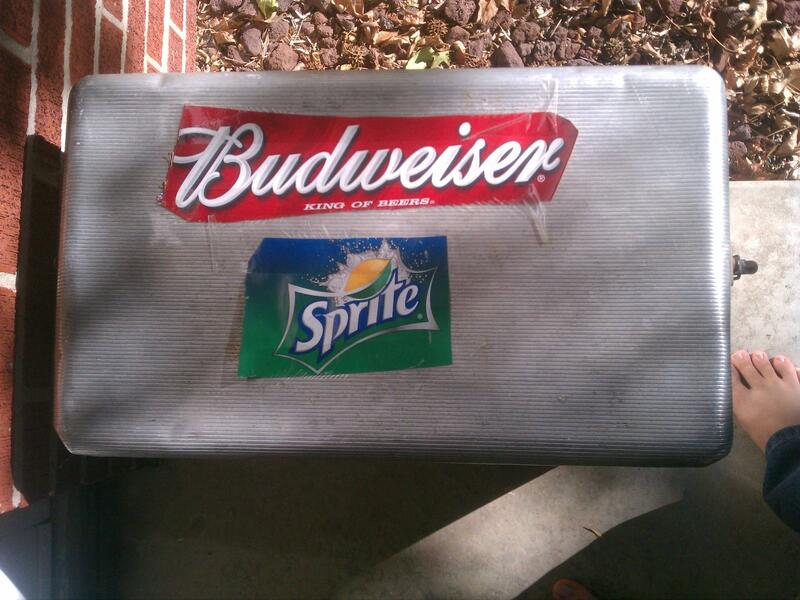 Use your empty drink boxes to label your coolers. 18. Warm beer can be chilled in minutes by placing it in salted ice. 19. Pour the perfect drink using this handy Solo cup guide. 20. Cook corn on the cob in a cooler if you're making in bulk. 21. Use your washing machine as an extra cooler. 22. Use laundry hampers as extra garbage cans. Always make sure you have a clearly labeled receptacle for recycling — those beer bottles are going to build up fast. 23. Line your garbage cans with multiple bags so you don't have to waste time re-bagging. 24. Keep pitchers of beer cold without watering them down with cups of ice. 25. Place a couple olive pits or toothpicks into the discard dish so that guests know what it's for. Psychology 101: If you don't hint at your guests what that little dish is for, they'll end up leaving their dirty toothpicks on the appetizer platter. 26. Oreo ice cream sandwiches are a super easy way to incorporate your team's colors into your dessert. Replace the cream filling with ice cream and roll in your ideal colored sprinkle mixture. Directions here. 27. Turn any potato skins into FOOTBALL potato skins with some piped sour cream. Just place the sour cream mixture into a Ziploc bag and snip the corner. Use as an impromptu piping tool. 28. Layer your jello shots to incorporate your team's colors. Get directions here. Use takeout containers if you want to make them ahead of time and keep them in the fridge. 29. Roll the meat for your sliders with a rolling pin (or a glass tumbler if you don't have one). Get the full recipe for these blue cheese and bacon sliders. 30. Make your deviled eggs en masse by "baking" them in the oven. Bake them in the oven at 325–350 degrees for 30 minutes. Your eggs will be creamier and easier to peel. 31. Buy your alcohol from Costco, even if you don't have a membership. The official rule at Costco and Sam's Club is that you don't need a membership to purchase alcohol and cigarettes. You might have to do a little bit of persuading with the card checker employee at the entrance who might be unaware of this policy, but don't let that deter you. The price of alcohol is usually 25–35% less than your typical liquor store, so the trip is totally worth it.